We both have a sweet tooth and think more is more when it comes to dessert, but, not everyone is mad for dessert like us so we thought we should show you the cheese table. 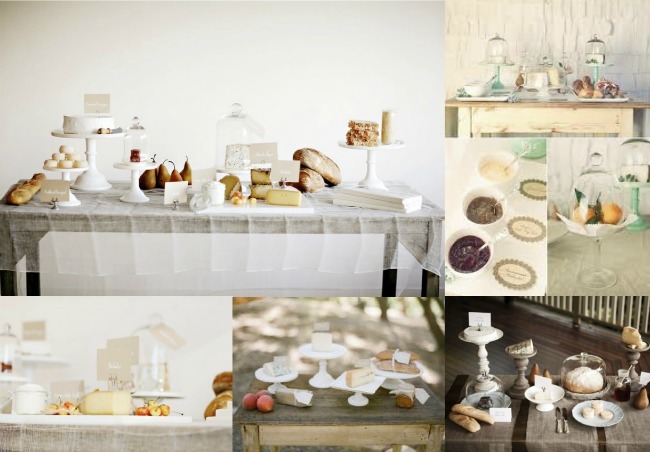 When planning your cheese table do the same as you would when planning a dessert table, choose one or two cheeses you and your sweetheart enjoy then choose a selected range of cheeses that will be crowd pleasers. Cheese loves company so serve it alongside different types of crackers and breads, muscatels, dried figs and apricots, slices of fresh pear and apple and offer condiments like quince paste, honey and a spiced chutney. Also, remember that not everyone enjoys cheese so consider serving petite fours at the end of the evening with tea and coffee.